Cruising South in France | Hello Cool World! The beauty of France is that everywhere we go, we find interesting buildings and sites. Case in point is the little town of Trélazé, just outside of Angers, we stumbled upon when looking for a place to stay. Not a town that would otherwise have drawn our interest, we were intrigued to learn that it was famous for its blue slate. Extensively used throughout the region, it could be seen on the roofs, paths and in the garden walls of the houses and chateaus for which the Loire Valley is famous. Appropriately enough, we stayed in a gîte in the centre of town called Les Nuits Bleues which, most importantly for the kids, had a dog (named Fiasco). Our hosts were so taken with our idea of a year-long trip around the world, they graciously left us a bottle of wine to celebrate. With Pierre-gil, Judith, and Fiasco the dog at “Les nuits bleues”. Aran and Chris felt it time to sit still and ‘chill’ for a day (and to finish off some overdue homework! 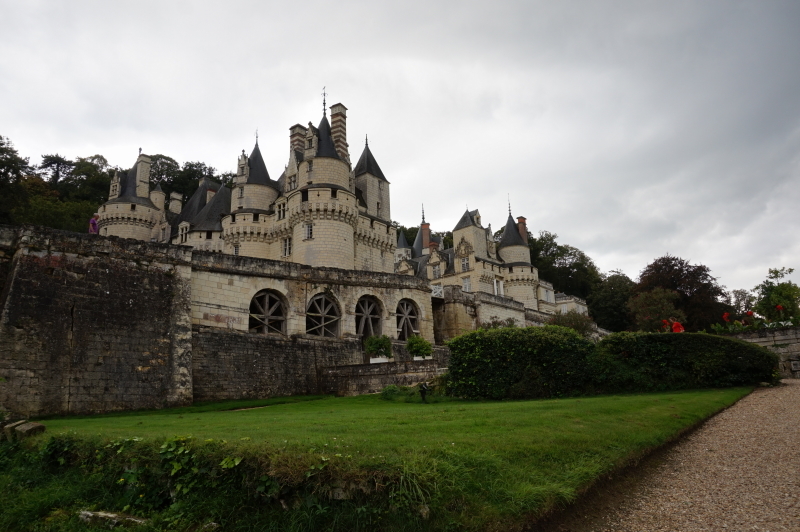 ), so Eva and I seized the opportunity to visit Ussé chateau; given that there are 88 chateaux in the Loire region to choose from, it was difficult to decide. After Eva heard that it was the chateau that inspired the tale of Sleeping Beauty, she was sold and so off we went for our first mother/daughter escapade. 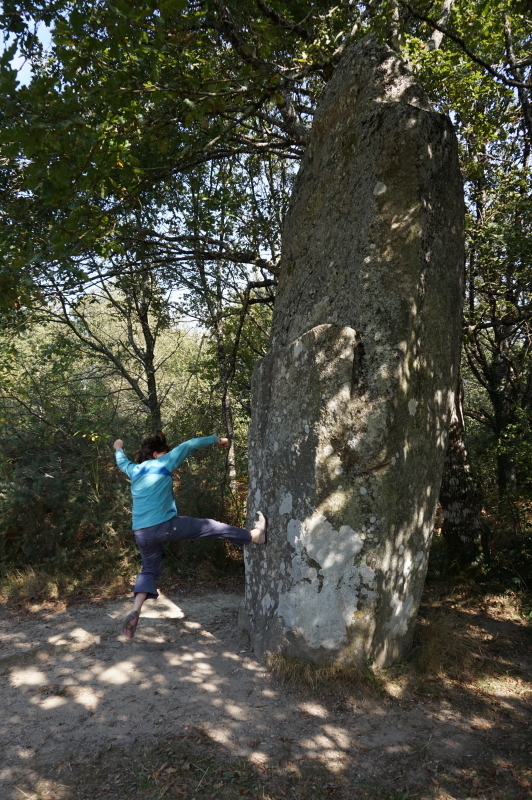 We then made our way further south making a brief stop along the way for a short hike to a menhir. 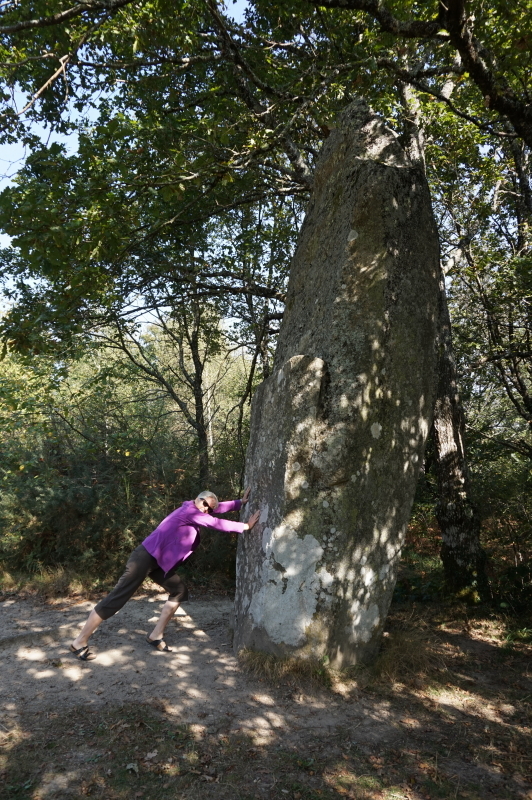 Anyone who has read Asterix knows what a menhir is and how Obelix carries them around all the time. They are big pointy stones that are stuck in the ground and the debate rages on today as to what purpose they served. Technically the name comes from Middle Breton, the language that was originally spoken in Brittany, and means ‘long stone’. Our other learning opportunity for the day was much more grim. 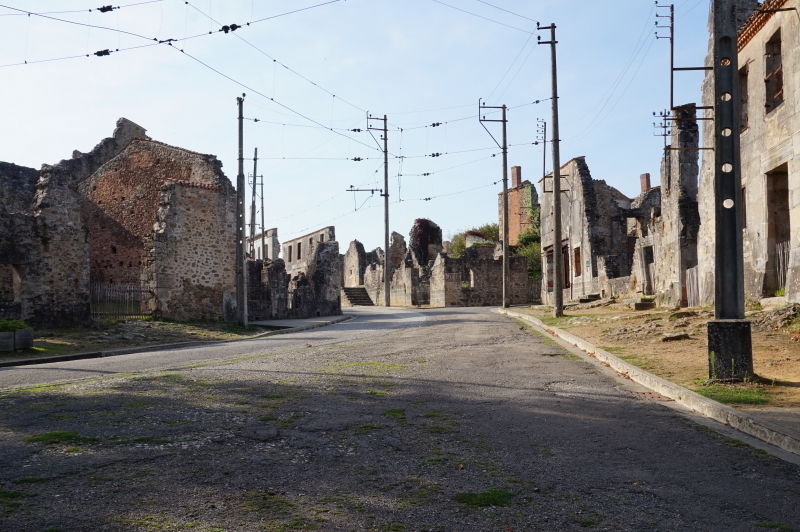 During our last visit to France, Chris and I had visited Oradour-sur-Glane with our friends, Daphne and Dion. This is a small village just north of Limoges which, on June 10, 1944 – just prior to the end of World War II – was destroyed by a German military company. In total, 642 inhabitants, including women and children were killed. While the men were shot, the women and children were herded into a church and it was set on fire. Only one woman escaped through a church window. 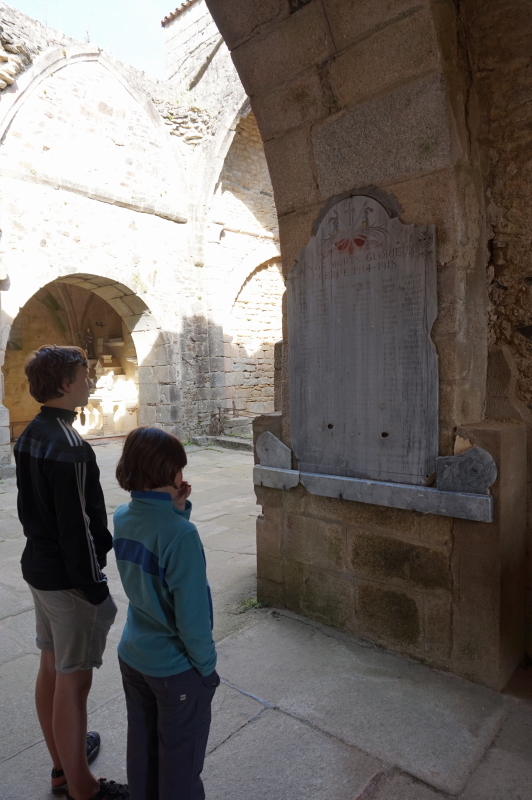 The reason it is so fascinating is that the town has been kept as a memorial and it has remained basically untouched since 1944. We were a very solemn family as we walked quietly through this tragic site. 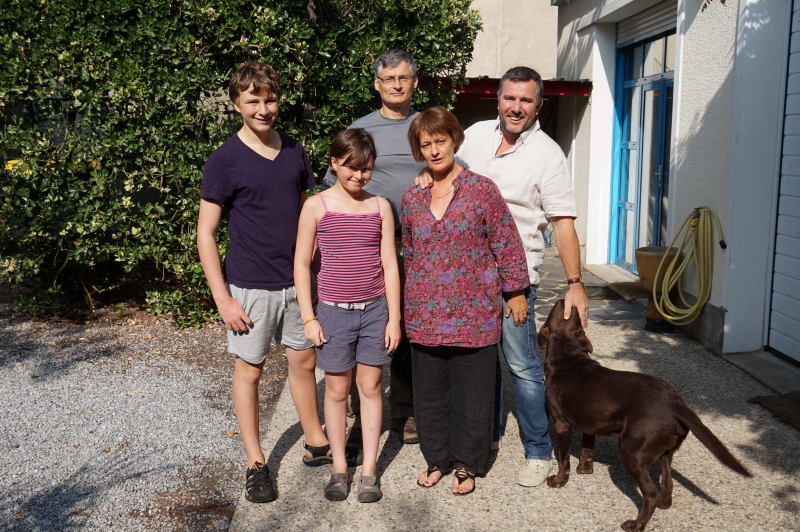 Moving into the Dordogne region, we stayed with more wonderful Servas hosts – Catherine and Patrick – just south of Perigueux. Eva was delighted to find that they had several animals, including a cat, chickens and rabbits. 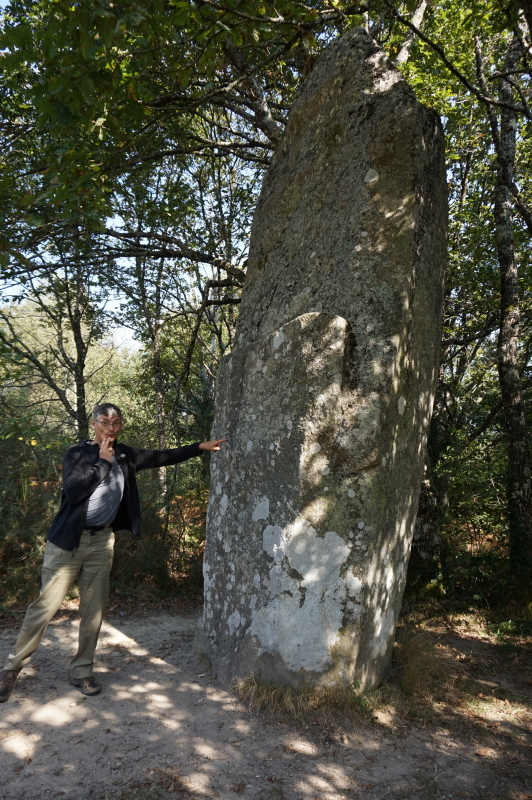 We explored the area the following day by heading to the Lascaux II cave in the morning. This area of France is famous for both its castles, as well as its Paleolithic art. Lascaux I cave (which dates back over 17,000 years) was found in 1940 but, due to damage sustained by the breath of too many visitors, it was closed to the public. A second cave, an exact replica, was created. It is this one that we visited. The paintings are absolutely amazing and depict animals that lived in the area so long ago including bison, bears and rhinoceros. After our visit to the cave, we drove around the countryside seeking out a perfect little lunch spot that Catherine had recommended. Needless to say, we didn’t stop until we found it and boy, was the drive worth it. After an almost 3 hours nosh, we managed to push ourselves away from the table and headed off for another hit of prehistoric art by visiting the Grotte de Rouffignac (Rouffignac Cave). This was a great thrill as we had to board a small, electric train that took us two kilometres underground. Imagine how dark it was when our guide turned out all the lights for a few seconds! With the lights fully on, we were able to appreciate just how amazing the cave paintings really are. Along with lots and lots of mammoths (there are about 158 paintings of them in the cave), there are also bisons, woolly rhinoceros and other such fantastic animals. Alas, no photos and no selfies were allowed, which actually helps to burn the memory of these prehistoric masterpieces into our minds. 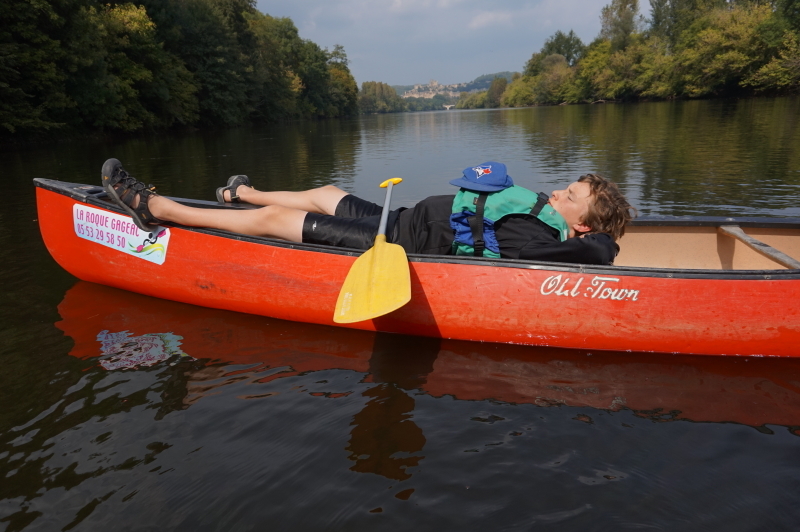 We had made reservations to head to a third cave the next day but began lamenting the fact that we didn’t have any time to spend canoeing the Dordogne River. Given that it was a beautiful day, we chucked aside the original agenda, picked up some paddles, and spent a most leisurely afternoon floating down the river. This truly is the best way to see some of the historic castles of the area. During the Hundred Years’ War (between 1337 and 1453) where the English and French fought to control France, the French held the Château de Beynac and the English held the Château de Castelnaud. All these years later, the two still stand proud today and stare each other down across the river. 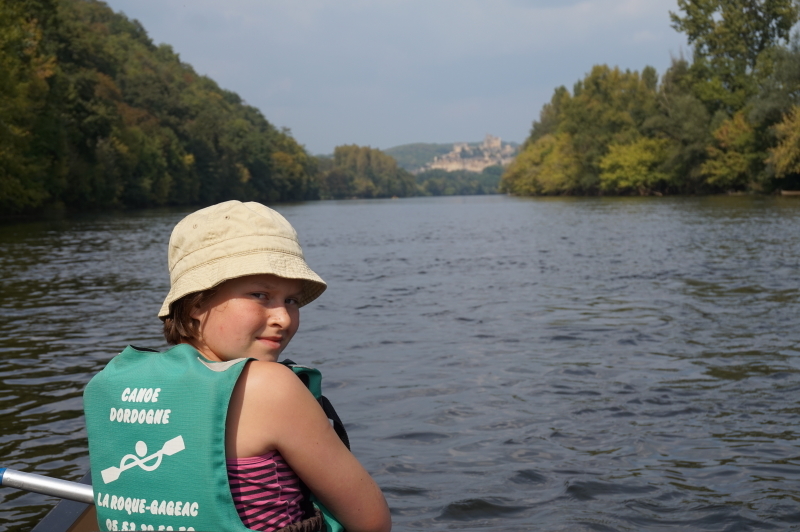 We ended our canoe trip within eyesight of a third castle, Les Milandes. This was formerly owned by Josephine Baker, the black American singer/dancer who made her name in Paris during the roaring 20s. Eva practicing her French: “Chapeau, chateau, eau”. Repetez. Next stop, Toulouse, where we visit old friends and create new memories. Wow, you are bringing back great memories for us. 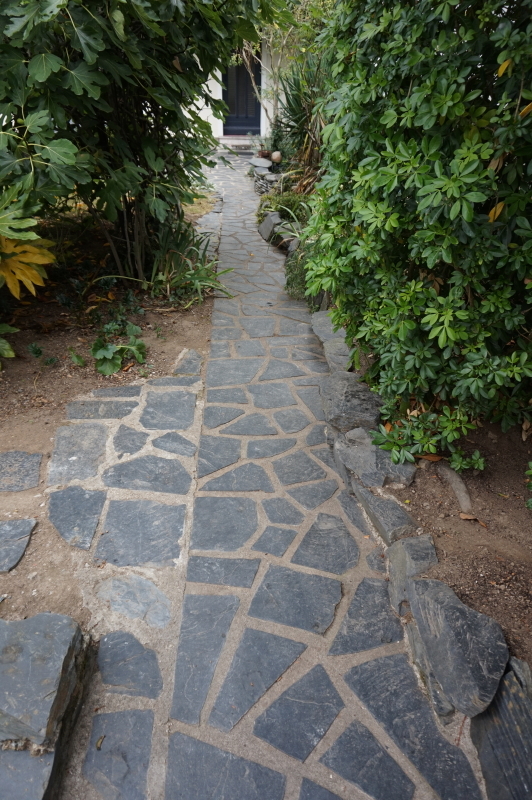 What a great thing, to retrace steps. Glad all is fabulous. Can you meet us in Portugal? We are here til the 19th…. Can you hop over to Venice?